The search engine pioneer has delivered big returns for long-term investors. Find out how its split changed its stock forever. This article was updated on Nov. 28, 2017, and originally published July 11, 2016. Many successful companies have done stock splits during their histories trading on a stock exchange, and Alphabet (NASDAQ:GOOG) (NASDAQ:GOOGL) has shared its bounty with shareholders by splitting its shares. However, the company behind the Google search engine broke new ground by using an unusual stock split structure, and the precedent it set has encouraged other companies to use a similar strategy in their own decisions to split their shares. Let's take a look at the Google stock split before the company renamed itself and what implications it has for Alphabet today. Google's search engine volume represented graphically. Image source: Google. Data source: Alphabet investor relations. One of the most interesting things about Google's stock split is just how long it took for the company to move forward with actually splitting its shares. The company first announced the split in early 2012. However, in an unusual move, Google shareholders challenged the split, arguing that its unique structure was against shareholders' best interest. That lawsuit was settled in late 2013, paving the way for the eventual split the following year. Why was Google's stock split so controversial? The issue some investors had with Google's stock split was that it didn't follow the usual pattern. Rather than simply doubling the number of shares outstanding, Google took the opportunity to create a brand-new class of shares, known as Class C shares. The idea was to distribute one new Class C share for every outstanding Class A share that public shareholders owned. In addition, insiders owning Class B shares would also receive Class C shares in the split. The perceived problem with Class C shares is that Google set them up to have no voting power. By doing so, the founders were able to do a stock split and get Class C shares as a result, which they could then sell or otherwise dispose of if they so chose, and still be able to retain their majority voting control of the tech giant. Pension funds and other institutional investors found that arrangement objectionable, and their lawsuit sought to stop the company from doing so. The eventual settlement of that lawsuit allowed the stock split to go forward, but it also provided for compensation in the event that the Class C shares traded at a discount of more than 1% from Class A shares over the first year they both traded. In the end, an average discount of between 1% and 2% prevailed, and so Class C shareholders received small payments from Google to compensate them for the alleged damage from the split. At times, the disparity between Google Class A and Class C shares has been far wider. As you can see in the chart below, there have been periods during which the difference between the two stock prices amounted to more than $30 per share, or more than 5% at then-prevailing prices. Recently, the difference has narrowed somewhat. Based on the chart above as of November 2017, the Class A shares fetch between a 1% and 2% premium compared to the Class C shares, reflecting investor ambivalence to the idea that their voting rights have much value. The fact is that even the voting rights Class A shares have are relatively meaningless. Because they wield 10 votes each, the insider-owned Class B shares still have majority control over the company and will continue to do so as long as their owners maintain the discipline not to sell them off. That will give them complete control over Alphabet as it moves forward. Most shareholders are comfortable with that idea, given the long-term returns the stock has provided. However, some investors are troubled that the move Alphabet made has caught on with other companies. Most notably, last year Facebook proposed a similar structure for its future stock split, and many companies have embraced multiple classes of shares that allow management to retain voting control while divesting the majority of the economic interest in their companies. Alphabet has delivered solid returns to longtime investors, and the stock split that gave them shares of a new class of stock broadened their ability to hold on to voting or non-voting shares as they saw fit. 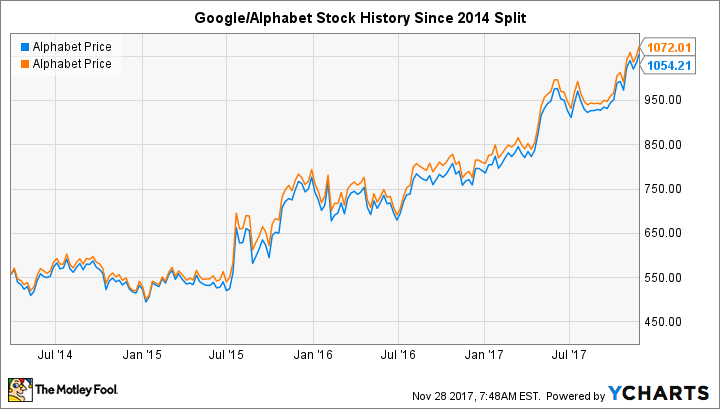 Regardless of which shares you own, Alphabet's future prospects look bright, and future stock splits might well come as the stock is now over $1,000 per share.